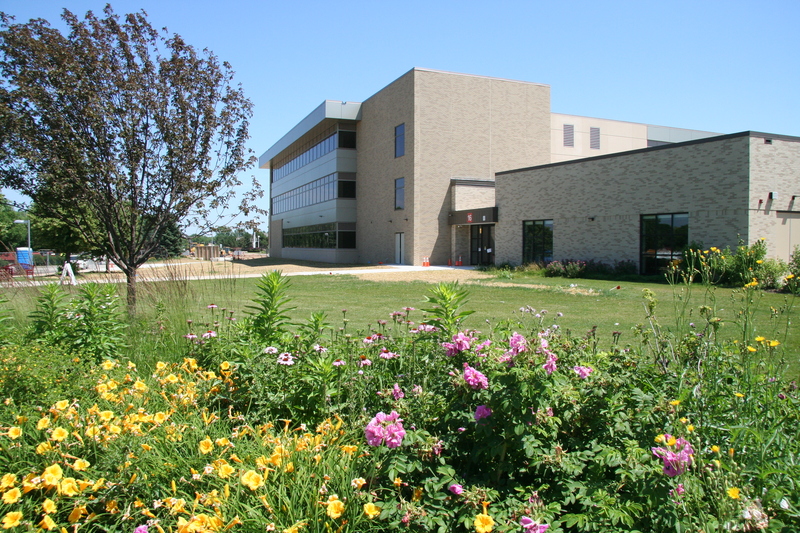 We’ve got a bit of a mess right now at the FVTC Appleton Campus. Between our building construction and the complete reconstruction of Bluemound Drive, the dust is flying, vehicles and people are being rerouted inside and outside the building, and things are a little chaotic even for the summer months. All signs of progress, I guess, and all of which will bring quite a transformation to our community’s campus. Health Simulation Technology Center opens Fall 2013. In a matter of weeks we will be opening the first of our capital referendum projects, the incredible new 3-story Health Simulation and Technology Center. It’s hard to describe just how exciting this accomplishment is for our organization as this is a facility that has been in the dreaming stages and then on the drawing board for so many years. It was about a decade ago that our then Dean of the Health and Service Division (Donna Elliott) had the foresight to see the promise that high-quality simulation technology held for our health-related programs. She supported several of our faculty in exploring and learning more about this technology and its applications. There’s been no looking back. Over time, we have (with the help of the region’s major healthcare partners—ThedaCare, Affinity, and Aurora) acquired a number of human patient simulators in the form of adults, children and infants and all with amazing capabilities from a teaching/learning standpoint. All of these simulators will soon move into the first floor of this new facility which has been designed as a virtual hospital. There, students and faculty will interact daily with these units that simulate conditions, symptoms, reactions to medications, and responses to the treatments given. What a great way to learn on a “dummy” versus a real patient! But these are no dummies…their eyes dilate, they have a pulse, the chest moves with their breathing, they talk, and much more. Scenarios can be created in a safe learning environment that students may never see in a hospital, clinical or field setting. And scenarios can be repeated until students perform in a way that produce successful patient outcomes. Our two faculty members who have been most involved in the advancement and utilization of this technology, Bob Sternhagen and Barb Tuchscherer, can hardly believe that this new facility is about to open and all their hard work is going to create a nationally recognized facility for health care education. Bob and Barb just returned from HSPN World 2013, the largest simulation conference for health care education, hosting more than 1,000 attendees from 35 countries. At the HSPN World 2013 conference, FVTC was one of five institutions recognized (internationally) as an education innovator of advancements and expanded use of healthcare simulation. FVTC also earned first place in the 2013 Viewers’ Choice Video Awards competition at the conference. The college took the top honors for its YouTube video highlighting the use of human patient simulation technology in training emergency medical responders, skilled nurses, dental professionals, and more. You’ll be able to visit our new Health Simulation and Technology Center at this year’s Community Open House on Tuesday, October 1. You can find more information about the event at www.fvtc.edu/openhouse. Last Friday evening I attended a very special awards program in Rice Lake, WI. It was the summer meeting of the trustees from all 16 technical colleges in the state, the District Boards Association. This association presented its annual TECh Award (technical education champion) to one of our outstanding local partners and good friend of FVTC, Mr. Mike Weller. Technical Education Champion Mike Weller, president of Miller Electric Mfg. 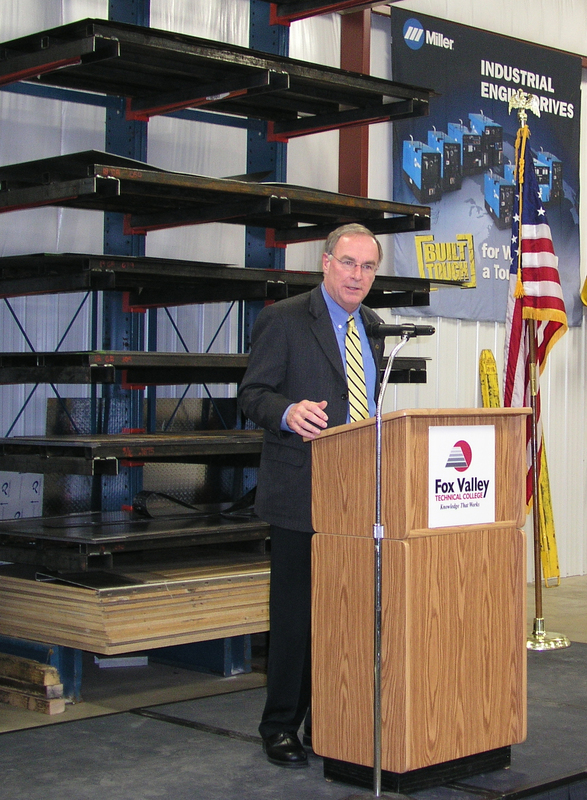 Co., discusses workforce training needs at FVTC’s Advanced Manufacturing Technology Center in Oshkosh. It was a pleasure to nominate Mike for this prestigious award. Mike serves as the President of Miller Electric Manufacturing Co. and ITW North America. I shared with the audience that evening that I’ve known Mike for 30 years, having first crossed paths with him when he was teaching an evening course for FVTC as an adjunct instructor and I was managing our evening school operations. So, 30 years ago he was already heavily involved with the College and giving back to his community by sharing his knowledge and experience with students. Mike’s contributions to technical education and our college have only grown over the years and we greatly value the wonderful working relationship between our organizations. He is without question a champion for technical education, the career opportunities it offers young people, and the essential role that high-quality post-secondary education and training plays in growing our economy. Let me share one other really wonderful glimpse into who Mike Weller is. Mike wasn’t able to attend this awards presentation as he had made a commitment to attend his 3-year old grandson’s birthday party. Now here’s a leader who has his priorities straight and I’m delighted that he kept his commitment to his grandson. 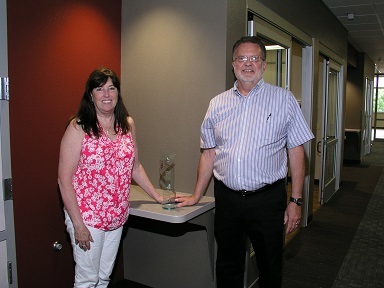 We were pleased to have Mike’s colleague, Tim Swanson, attend and accept this award on Mike’s behalf. It was a great opportunity to share this occasion with Tim as he serves on the FVTC Foundation Board of Directors. On a final note, the TECh Award can be made to an individual or an organization. In 1997 Miller Electric Mfg. Co. was the recipient of this award. Now, its leader Mike Weller has been honored by our System’s district boards with this award in 2013. Both have clearly been technical education champions, our champions, for many years.